Business leaders seek better insights for smarter decision-making. Unfortunately, today’s traditional intelligence tools were designed for two-dimensional transactional systems. As data from consumer trends such as mobile, social, cloud, big data, and video make their way into the enterprise, organizations seek new tools to discern insight from these new engagement and experiential systems. In fact, leaders seek more than just reporting and dashboards, they expect to make real decisions. A recent Constellation Research survey identified key expectations from business analytics to include: supporting business strategy and planning; optimizing costs across the value chain; identifying hidden patterns and relationships in big data; providing context for relevant engagement; and predicting demand in networks. The shift from transaction to engagement to experience depends on better business analytics. Success requires that new business analytical tools support the information supply chain as data moves from a cacophony of upstream data sources to new and innovative downstream modes of consumption. Why Does Everyone Need Analytics? Because work—as we know it—soon won’t be as we know it. Think real time. Connect finance and operations together with plans, forecasts, budgets, and a global view of the business so that everyone can see what they need, the way they need it. Think mobile. Manage your business anywhere with a swipe of your finger from an iPad or mobile device by updating plans, doing real-time analysis, and collaboration. Excel who? 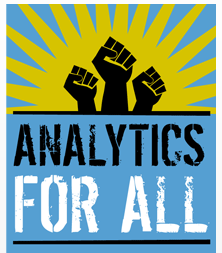 Think analytics for all. Come join us for an interactive discussion and webinar! Register today!